It turns out that the single-minded focus on the overturning of Roe v. Wade has missed the point. Roe is being undermined not by a sweeping decision, but by its systematic chipping away, state by state, in a game of chicken between anti-choicers and major pro-choice organizations. It's no accident that the literally hundreds of proposed state-level laws restricting abortion rights, 15 of them already enacted, are so flagrantly unconstitutional. The state legislation director of the National Right To Life Committee tells Politico today, "This is all an explosion, which we think if presented to the court, they would recognize the rights of the fetus. I was surprised it wasn't challenged, and I would like to see that." The stated reason she hasn't, according to Center for Reproductive Rights head Nancy Northrup, is that the restrictions affect a small number of abortions — Kansas's new fetal pain law, for example, would have banned 343 of the 10,806 abortions in 2007, according to Politico. "We don't jump just because the anti-choice movement jumps. We're focused on pursuing cases that ensure that women have access to all abortion services. They're trying to move the agenda to a small percentage of cases, but we're not fighting on their turf." A more convincing explanation is that pro-choice groups are afraid of this Supreme Court, particularly with moderate Sandra Day O'Connor having been replaced by anti-choice Alito in 2006, and with swing-vote Anthony Kennedy being on record in 2007's Carhart vs. Gonzales upholding the "partial-birth" abortion ban with this thoughtful concern: "While we find no reliable data to measure the phenomenon, it seems unexceptionable to conclude some women come to regret their choice to abort the infant life they once created and sustained." Per the interview with NOW's Terry O'Neill below, they worry that if they challenge one of these laws in blatant violation of Roe, not only would the Roberts court overturn it, but it might also issue an even broader judgment that would leave women worse off. But as Dahlia Lithwick points out in Slate today, and Rachel Maddow has been suggesting for some time, practically speaking, abortion rights are being chipped away as if Roe didn't exist. States like New York have liberal laws in place, while women in Kansas and Nebraska are denied their rights. As Maddow asked last week, where does it end? Given that public opinion has changed virtually not at all since Roe v. Wade, my guess is still that the Roberts court is as uninterested in overturning the law as its challengers are in forcing the issue. It does not want to be the court that makes abortion illegal, or all-but-illegal, in America. The backlash would be staggering. The conservatives on the court are much happier with the status quo, allowing abortion as a matter of federal law while the states effectively outlaw it as a matter of fact. If the states continue to hollow out Roe from the core, there will be no reason for the court to hear an abortion case ever again. 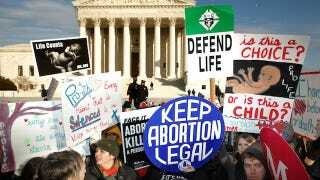 But, she says, pro-choice organizations are essentially ceding the rights of women in states like Nebraska and South Dakota. (Update: See below.) It's a grim choice between the guaranteed incremental encroachment on women's rights in certain states, and the risk that even more will be taken away by the court. Update: A representative from Planned Parenthood Minnesota, North Dakota, South Dakota writes to object to the notion that pro-choice organizations there are ceding to the anti-choice legislation in South Dakota, pointing out that "both Planned Parenthood and the ACLU plan to litigate HB 1217, and are still involved in litigation against a 2005 SD law."